Today in Masonic History François-Marie Arouet (a.k.a Voltaire) was born in 1694. François-Marie Arouet (a.k.a Voltaire) was a French philosopher and intellectual during the Enlightenment. Voltaire was born in Paris. The date of his birth is generally accepted as November 21st, 1694. Although Voltaire himself claimed the date of his birth was February 20th, 1694 and there is some contention about the actual date of his birth. He was educated at the Jesuits at the Collège Louis-le-Grand from 1704 to 1711. He learned several languages like Latin and Greek. He also became fluent in Italian, Spanish and English. Voltaire's father wanted him to became a lawyer, Voltaire had other plans though, wanting to become a writer. For some time he lied to his father about his profession claiming that he was working in Paris as an apprentice to notary. When his father found out he sent Voltaire out of Paris to attend to legal studies. 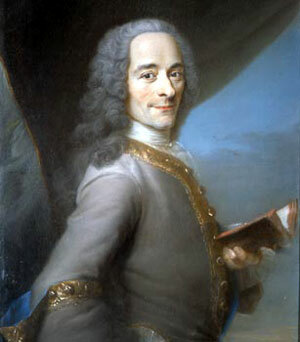 Much of Voltaire's life revolved around Paris. Much of his writings were satirical in nature and involved attacks on the absolute monarchy of France at the time and the religious intolerance that was rampant in France. After returning to France from his brief legal studies he wrote a verse about the Régent. The verse implied an incestuous relationship between the Régent and his daughter. For that Voltaire was thrown into the Bastille for 11 months. This would not be the last time that Voltaire would be imprisoned for his works. While in the Bastille, Voltaire wrote his first play, Œdipe, which established his reputation in French society. In 1726, Voltaire came up against a French nobleman who had insulted him. When Voltaire attempted to take legal action against the man, the well connected family got a lettre de cachet from King Louis XV. The letter declared Voltaire was to be imprisoned. Fearing an indefinite sentence, Voltaire asked to be exiled, which he as granted. He would live in London for two years. He spent his time understanding the constitutional monarchy of England and was influenced also by classic English literature including Shakespeare, who early in his life Voltaire tauted Shakespeare's genius, later in life he would steer people away from what Voltaire felt was the violence in Shakespeare's plays. While in London it is believed he began an association Isaac Newton. Voltaire is believed to have been at Newton's funeral. It is also believed that Voltaire is the source of the famous apple story when Newton came up with his theories on gravity. When Voltaire returned to Paris, after almost three years in exile, he attended a dinner. There made connections with individuals who were going to buy up the national lottery. Voltaire joined with them and became a wealthy man. Before long, despite his relationship with Madame de Pompadour, the King's mistress, he found himself in trouble again. This time he fled Paris for the French countryside. There he met Émilie du Châtelet, an Enlightenment figure in her own right. The two would begin having an affair, although many accounts the affair had as much, if not more, to do with intellectual stimulation they provided each other. Both Voltaire and Émilie looked at the science of the physical world (both are considered Newtonians in their opinions despite other scientific theories of the time) and the metaphysical world. The two worked together on writings about the Bible and how it impacted their time. After the passing of Émilie in 1749, Voltaire tried to headed to Potsdam to visit his friend Frederick the Great. Before long though Voltaire's satirical writings led to him falling out of favor with Frederick and would lead to his arrest. He then headed back to Paris. King Louis XV banned him though from the city so he headed to Geneva. Before long he was forced out of Geneva and headed back into France. In 1762, Voltaire picked up the cause of the unjust French legal system of the time. A Huguenot (French Protestant) merchant at the time was accused of killing his son for wanting to convert to Catholicism. The man was tortured to death, all of his possessions were confiscated and his remaining children were removed from the family home and sent to monastery. By 1765, Voltaire had gotten the conviction overturned. Voltaire passed away on May 30th, 1778. There are numerous accounts of what happened at his death bed. One of the stories claimed that a Catholic priest asked Voltaire to renounce Satan. To which Voltaire replied, "Now is not the time for making new enemies." Because of his criticism of the Church, Voltaire was denied a Christian burial, although some of his friends buried him before the edict was announced. Later during the French Revolution his body was moved to the Panthéon, because they considered him one of the original founders of the Revolution. On April 4th, 1778 Voltaire was initiated as an Entered Apprentice in the Loge des Neuf Soeurs (Lodge of the Nine Sisters) in Paris. He was escorted by his close friend Benjamin Franklin. Some speculate that Franklin was the one who pushed Voltaire to join the fraternity and that Voltaire joined only to please his friend. Voltaire would not progress past the degree of an Entered Apprentice passing away just under two months later.